Synthetic peptide within Human Lactate Dehydrogenase B/LDH-B aa 1-100 (N terminal). The exact sequence is proprietary. Previously labelled as Lactate Dehydrogenase B. Our Abpromise guarantee covers the use of ab53292 in the following tested applications. WB 1/50000 - 1/200000. Detects a band of approximately 37 kDa (predicted molecular weight: 37 kDa). Note=Defects in LDHB result in deficiency of lactate dehydrogenase, a condition with no clear symptomatic consequences. Lactate dehydrogenase deficiency can probably be considered a non-disease. Lanes 1 - 3: Merged signal (red and green). Green - ab53292 observed at 37 kDa. Red - loading control, ab130007, observed at 130 kDa. ab53292 was shown to specifically react with Lactate Dehydrogenase B in wild-type HAP1 cells as signal was lost in LDHB (Lactate Dehydrogenase B) knockout cells. Wild-type and LDHB (Lactate Dehydrogenase B) knockout samples were subjected to SDS-PAGE. Ab53292 and ab130007 (Mouse anti-Vinculin loading control) were incubated overnight at 4°C at 1/50000 dilution and 1/20000 dilution respectively. Blots were developed with Goat anti-Rabbit IgG H&L (IRDye® 800CW) preabsorbed ab216773 and Goat anti-Mouse IgG H&L (IRDye® 680RD) preabsorbed ab216776 secondary antibodies at 1/20000 dilution for 1 hour at room temperature before imaging. 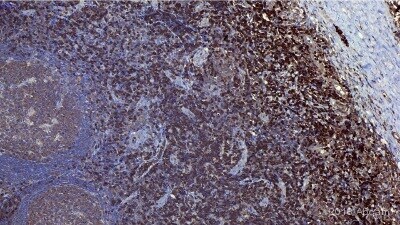 ICC/IF image of ab53292 stained HepG2 cells. The cells were 100% methanol fixed (5 min) and then incubated in 1%BSA / 10% normal goat serum / 0.3M glycine in 0.1% PBS-Tween for 1h to permeabilise the cells and block non-specific protein-protein interactions. The cells were then incubated with the antibody (ab53292, neat) overnight at +4°C. The secondary antibody (green) was ab96899, DyLight® 488 goat anti-rabbit IgG (H+L) used at a 1/250 dilution for 1h. Alexa Fluor® 594 WGA was used to label plasma membranes (red) at a 1/200 dilution for 1h. DAPI was used to stain the cell nuclei (blue) at a concentration of 1.43µM. Overlay histogram showing HeLa cells stained with ab53292 (red line). The cells were fixed with 80% methanol (5 min) and then permeabilized with 0.1% PBS-Tween for 20 min. The cells were then incubated in 1x PBS / 10% normal goat serum / 0.3M glycine to block non-specific protein-protein interactions followed by the antibody (ab53292, 1/100 dilution) for 30 min at 22ºC. The secondary antibody used was DyLight® 488 goat anti-rabbit IgG (H+L) (ab96899) at 1/500 dilution for 30 min at 22ºC. Isotype control antibody (black line) was rabbit IgG (monoclonal) (1µg/1x106 cells) used under the same conditions. Acquisition of >5,000 events was performed. To whom it may concern, I am looking for an anti-LDHB antibody. I found the ab53292 antibody on the Epitomics website (Cat.#: 2090-1), which states that it is specific for the B isoform and that it can be bought through abcam. However, this product on the abcam site does not mention any specificity for an isoform. Is it the same one as the Epitomics antibody and with that specific for LDHB? Is there any cross-reactivity with other isoforms? Thank you for your help. Es handelt sich hierbei um das selbe Epitomics- Produkt, da wir unsere Produktpalette mit diesen Antikörpern erweitert haben, und diese Antikörper wurden 1:1 aus dem Epitomics Repertoire übernommen, und auch noch im Epitomics Labor hergestellt. A synthetic peptide corresponding to residues near the N-terminus of human LDH-B.